The only thing I’ve never tried to make ahead is the turkey but after reading this post of Amy’s, over at The Finer Things in Life, I think I’m definitely going to give it a try one of these fine holidays. Have a great one! I’m thankful to all of you for coming by week after week to join me here as we bless our families and our budgets with our menu plans. If you haven’t entered the giveaway to win a Kraft Foods Gift Basket, it’s not too late. The giveaway ends on Tuesday, November 24th at 9:00 pm PST. Thanks for having menu plan Monday. I really enjoy your recipes/ideas and seeing others too. Happy Birthday to your little guy! 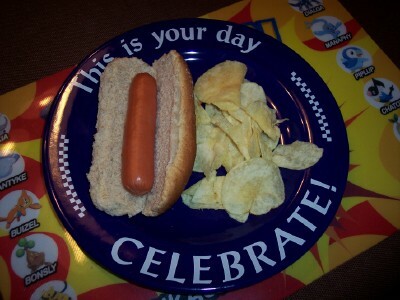 Hot dogs and chips sounds like a winner to me! 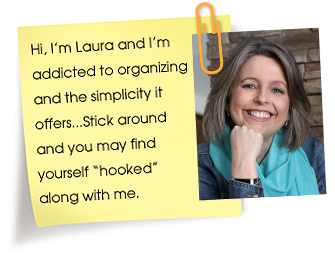 Thanks for hosting MPM Laura! Happy Birthday to your birthday boy! I am very jealous that Canadians celebrate Thanksgiving a month early. It totally makes more sense! The mad rush of the holidays makes one feel the stress, plus Thanksgiving is cheated out as the stores start Christmas selling early. I can finally join in and participate with a blog that isn’t private! My comment doesn’t have anything to do with your current blog post. I just wanted to say congratulations for a great blog!I love it! I am also green with envy because you’re such an organized person.Maybe now that I follow your blog something will rub off in my direction. Thank you for doing this. I LOVE it! Linky 105 is a mistake. If you can, could you please delete it? While this year will be my first year making a turkey on my own, my mom typically makes the turkey ahead of time — this is because we often bring the turkey to my grandparents, and its much easier to take a pre-cooked turkey than to plan to be there early enough to actually cook it! I haven’t even thought of a Thanksgiving menu yet. We may have a couple coming over but not sure. Is it awful & unpatriotic if I just want to eat pumpkin pie and a Thanksgiving leftover loaded sandwich? Happy birthday to your son! I love your suggestions for make-ahead things for Thanksgiving; I will have to look into it next year. Some of your meal links look great! Hi! This is my first time joining you. Thanks for hosting Menu Plan Monday! Thanks for the make ahead tips, I am thankful you are thinking of us this week and trying to make our lives easier! I’m so interested in your idea to do stuffing in the slow cooker. Do you think it’ll come out with any toastiness or will it be really soft? My family likes the “crunchy” bits as it bakes in a pan. We don’t stuff our bird. The fewer things in the oven though the better right? I’m taking a cue from you and going with an easy Sunday meal this week. As a newer blogger, I am thrilled with the wonderful ‘community’ I have found. What a helpful site you have! Hot dogs and chips, nice! Not a very time intensive meal, eh? I like the idea of doing the big turkey meal ahead of time, too. Especially if you have friends visiting. This gives you more time for visiting. Hi There! I’ve been following you for about a month or so and I’ve really been enjoying reading the Menu Plan Monday posts. 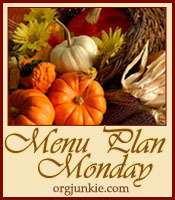 I decided to go ahead and take the plunge and link to my first Menu Plan Monday blog post this week. Thanks for hosting this! And Happy 4th Birthday to your Little Man! Thanksgiving is in my mind. Make a berry crisp for dessert. My daughter is make pumpkin pie from scratch. Dad cut up pumpkin for her, she cooked down the pumpkin in oven and is experimenting with the seeds. (she’s almost 30–5 days before Christmas). Will help her with pie crust on Wed and she will bake it then. As for the rest of the week, I’m working on that today. Have lots of things that will go together just need to figure out what. I was gone over the weekend so I’ve not decided anything yet. 😉 Take care and happy Thankful Week to all of you!! We have so much to be grateful. God Bless! Our sons share the same birthday. Mine turned 2 yesterday! We call him our turkey since he was born on Thanksgiving day. Thanks for the great Thanksgiving Day ideas! I’m looking forward to this week! Thank you for this post! I am going to try the potato trick on Wednesday! Keep all the great ideas and tips coming! They are all very much appreciated! I am late but none the less it is now published on my blog. I have to say I really need this plan at this time of the year. 15 working days until the end of the school year and the summer holidays. I cant wait. I have also found the slow cooker beef stew recipe you use to be tried and true. I’ve made it several times and it is always a hit.